Come and meet Heather Callahan from Riverbend Nursery to learn all about perennials! Heather is an experienced horticulturist and avid gardener who enjoys growing just about any kind of plant either inside or outside the house. Reston Farm Market is proud to announce the participation at the Home and Garden Marketplace that will take place on May 5, 2019 from noon till 5:00pm at the Reston Town Center Pavilion. Come by to say hello and get some of our amazing products for your garden and home! We look forward to seeing you there! Roses are both stunningly beautiful and challenging to care for. Come to our educational workshop featuring roses expert Matthew Boyd and learn everything there is to know about roses. The first 50 attendees will receive a free book giveaway on how to grow knock out and other easy-care garden roses. Don’t miss this great educational session at the Reston Farm Market on how to grow healthy plants with Smart Pots. Bring your little ones to take pictures with Easter Bunny! This is a free event and you will be able to take your own pictures. Each child will get an Easter gift bag filled with Easter goodies and our special treat - one (1) Day Pass to our famous Fall Festival! Did you know? Santa will be visiting the Reston Farm Market! Bring your little ones out to take your own pictures with Santa! This is a FREE event. Register at the market in person. Bring your little ones to take pictures with Santa at the legendary Reston Farm Market! Does Santa send an elf to your house every year? Stop by the Reston Farm Market to check in with Santa and find out when your visitor will be returning. It’s this time of the year! Time to visit the legendary Christmas Tree Market in Reston! We have lots of surprises ready for you to make the Holiday season memorable! Join us for a #TealPumpkinProject to help raise awareness of food allergies and promoting inclusion of all trick-or-treaters throughout the Halloween season. Contribute and help create a safe, happy Halloween for all kids! Save the date for the Jacks are Wild - famous Dog Show at the Reston Farm Market! Mario and Bella are a spirited pair of Jack Russell Terriers that love to perform tricks and amaze their audience! They can do a variety of tricks from jumping rope to skate boarding, rolling on a barrel to a walking handstand and many others. It's a unique show and shouldn't be missed! Face painting day? Why not! Bring your kiddos to the Reston Farm Market and have a blast with the master artists from Trist N shout Entertainment. Visit our farm animals, have a cup of fresh cider, pick a pumpkin or two. What can be better than some unlimited family Fall Fun? See you there. Join us for a fun-filled day with the master magician from Trist N shout Entertainment! Don’t forget our other super fun activities - petting zoo, moon bounces, train rides, face painting, pumpkins, and more! This is part of our autumn event series and we are excited to be able to bring some fun to our community in Reston! We are excited to host an inspirational speaker and writer, Dianne Tolliver, for her book signing event at the Reston Farm Market. Living Through Troubled Times: Witnessing the Rainbow explores the inspirational journeys of twenty-one courageous people who encountered insurmountable storms in their lives and personally witnessed the rainbow of God's love and support. Looking for something fun and family-friendly to do in Reston? Look no further! Come to the Reston Farm Market and have a fun-filled day with the master balloon artist from Trist N shout Entertainment. This is part of our autumn event series and we are excited to be able to bring some fun to our community in Reston! The Reston Farm Market brings the Circus on Strings Puppet Show event for you and your family here in Reston! The show starts at 11 am and goes to 2 pm. Also, enjoy unlimited train rides and moon bounces, a cup of fresh apple cider, pumpkins, petting zoo, face painting, balloons, and more! Sunday-funday! Stop by the Reston Farm Market to watch Rufus - an incredible puppet show by Blue Sky Puppet Theater. There’s more! Watch your kids have a blast with unlimited moon bounces and train rides, petting zoo, face painting, glitter tattoos and more while you enjoy fresh apple cider and pick a pumpkin! 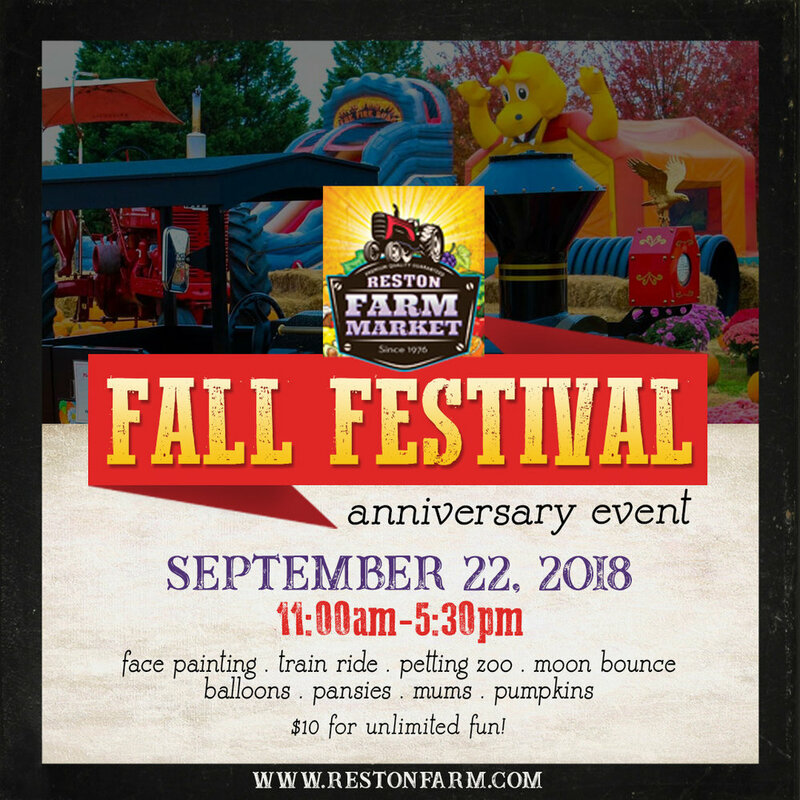 Join us for some Fall Fun at the Reston Farm Market with the family friendly music and dancing by an award winning DJ, Chi DR Productions from 2:30 PM till 5:30 PM. Also enjoy our fun moon bounces, train rides, farm animals, games, fresh apple cider, pumpkins, and more amazing fall season offerings that we have in store for you! Come join us for amazing puppets show called 3 Lil’ pigs put on by Blue Sky Puppet Theater. Shows will Run from 11 am to 2 pm with a break at 12:30 pm. Also enjoy our moon bounces, farm animals, games, face painting, glitter tattoos and more! Pumpkin Painting Event at the Reston Farm Market! The space is limited, so call (703) 759-000 or email info@restonfarm.com to book in advance! *UPDATE: Due to a popular demand, we are extending the event hours from 11 am to 5:30 pm. Looking for something fun and family-friendly to do in Reston this fall? Look no further! The Fall Festival at The Reston Farm Market is happening daily (with an exception of inclement weather) from 11:00 AM to 5:30 PM. Unlimited fun of train rides, moon bounces, pumpkins, apple cider, and more! Don't miss the sampling event brought to you by our friends from Trickling Springs Creamery! Stop by the Reston Farm Market this Saturday to taste their Farm Friend milk and delicious chocolate milk! Save the date for our special Christmas Tree Market in Reston, VA! We are getting ready to bring unforgettable Winter Season's celebrations to your hearts and homes. Ready to explore what Northern Virginia countryside has to offer and see where all the farm goodies at the Reston farm Market come from? We organize frequent fun-filled field trips to the farms of Norther Virginia. Please contact us in advance to make a reservation. Bring your little ones to the Reston Farm Market Petting Zoo and let them learn, pet, and feed our lovely farm animals. The Grand Opening of our lovely Fall Season is almost here! Grab your family and friends, and come by to spend a fun-filled day at the Reston Farm Market this Saturday, September 23, 2017. Enjoy train ride, moon bounce, and petting zoo. We can't wait to see you there!